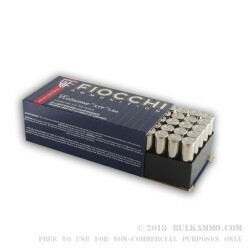 A premium loadout from Fiocchi, but in the understated, humble way that Fiocchi does things, you aren’t going to pay for that premium load. You are going to get a bargain. 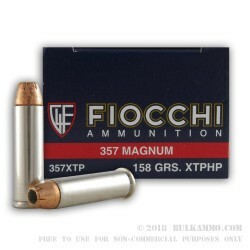 Sometimes Fiocchi can outprice with premium projectiles, and a nickel plated brass with Boxer priming, some remanufactured ammunition lines. That’s the type of power the Italian company can offer. But forget about charging you for it, they will just pass the savings along to you, the consumer. Pigs get fat and Hogs get slaughtered. 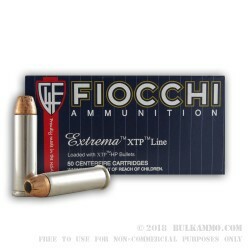 Fiocchi hasn’t been greedy or asking for too much money, and so they have been able to get very fat by picking up the consumers that are sick of price gouging. Their company value has skyrocketed on the back of this philosophy and the company continues to pump out great ammunition 24/7. This is the .357 Magnum load with the premium jacketed hollow point projectile from the XTP line. It is a 158 grain projectile which is still a hot round for self-defense. Nickel plated brass cartridge casings and Boxer primers means this is easily reloadable, giving you access to premium brass that can be reloaded for a long time. This is a 500 round case lot for purchase.